At One Hour Tees, we use two main methods of printing your t-shirts. Direct to Garment (DTG) and Silk Screening. Both technologies produce stunningly beautiful graphics, letters, and designs. The only difference is when and why you would want to have a shirt printed using the DTG process versus silk screening. We’re going to take a look at both printing processes and compare and contrast them. While there is no superior printing technique, we will discuss when you should opt for silk screen printing and when you should consider having your shirts printed via the DTG process. DTG printing uses digital technology to apply designs, logos, and lettering to t-shirts. Once the client has approved the design, it’s uploaded to specialized printing software that resides on the DTG computer. A blank t-shirt is fed into a specially-designed digital printer and ink that is specially made for textiles is applied to the shirt. The inks are specially designed to be strong, durable, and incredibly vivid in color. 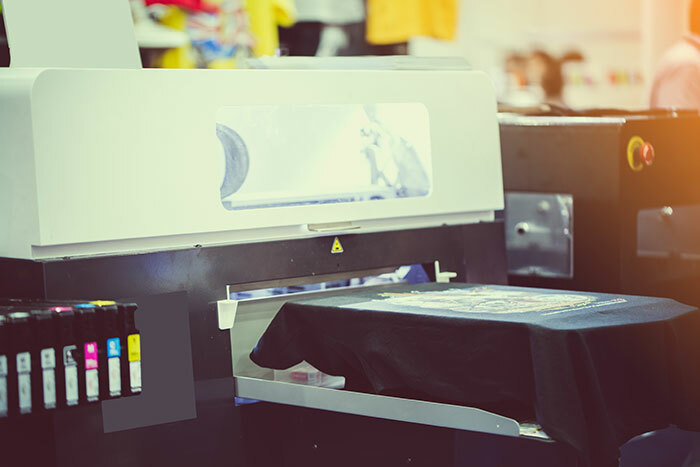 The overall time it takes to print one shirt is anywhere from five to ten minutes, depending on the complexity of the design and how many colors were used. The result is a t-shirt with a custom printed design that is as high quality as anything you’d find in a high-end department store. The Silk-screening process of printing a design on a t-shirt has been around for decades. Ink is pushed through a woven mesh stencil onto the t-shirt. A rubber or plastic squeegee is used to manually push and pull the ink over the stencil until the t-shirt has absorbed it. Silk-screening is unique in that it’s all performed by hand. The setup process takes the longest amount of time, as the stencil must first be created, and the entire machine set up for a printing run. Only one color can be printed at any given time, so there is a limited amount of colors that can be used. Each subsequent color will require more time to apply (including drying time), and that can increase the cost slightly due to more manual labor being required. DTG printing offers many advantages over traditional silk-screening. There are certain situations where you would definitely want to opt for DTG over silk screening, and vice versa. DTG is best for small orders such as 20 shirts for your local kickball team, or 15 shirts for your bachelor or bachelorette party. The cost per shirt is much lower than silk screening due to how quickly shirts can be printed using the DTG method. It should be noted that just because DTG printed shirts cost less than silk screened ones, that doesn’t mean their quality is any less. The DTG printers we use at One Hour Tees are state-of-the-art and have a very high resolution. This means all the details of your design will show up crystal clear and you can choose one (or more) of many different colors. Ink will appear slightly “raised” due to the nature of the silk screen process. The prices for silk screen printing versus DTG printing can vary. For starters, a silkscreen run requires an extensive setup process; this is why we have a 25-shirt minimum order. DTG printing is more cost-effective for smaller shirt orders. You also get a discount if you order shirts in bulk. The more you have printed up, the more you’ll save. Also, keep in mind that silk screening will cause the ink on the shirt to be raised very slightly. This can be a benefit if you’re going after a certain look or design. With DTG printing, the color and design are as good as anything you’ll find in a high-end department store – except you won’t be paying an arm and a leg for it! When it comes to quality, there is really no difference between DTG and silk screening. DTG is best for smaller batches with more intricate designs and color requirements while silk screening is superior for single color, large quantity runs. No matter which t-shirt printing method you choose, you’ll be happy with the results. We pride ourselves on the quality of our work, and each order we create undergoes a strict quality-control check before it’s shipped out. At One Hour Tees, we can not only create the perfect custom t-shirt for you or your organization, but we’ll also have it shipped or delivered to you or your event when you need it.